The Core Science Systems Mission Area delivers nationally focused Earth systems and information science that provides fundamental research and data that underpins all Mission Areas of the USGS, the USGS Science Strategy, and Presidential, Secretarial, and societal priorities. 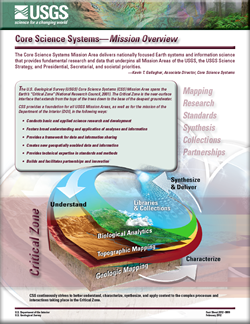 The U.S. Geological Survey (USGS) Core Science Systems (CSS) Mission Area spans the Earth’s “Critical Zone” (National Research Council, 2001). The Critical Zone is the near-surface interface that extends from the tops of the trees down to the base of the deepest groundwater. Gallagher, K.T., 2012, Core Science Systems—Mission overview: U.S. Geological Survey Fact Sheet 2012–3009, 4 p.